This undated Tarjeta Postal features the Monte Albán1 ruins in Oaxaca, Mexico. 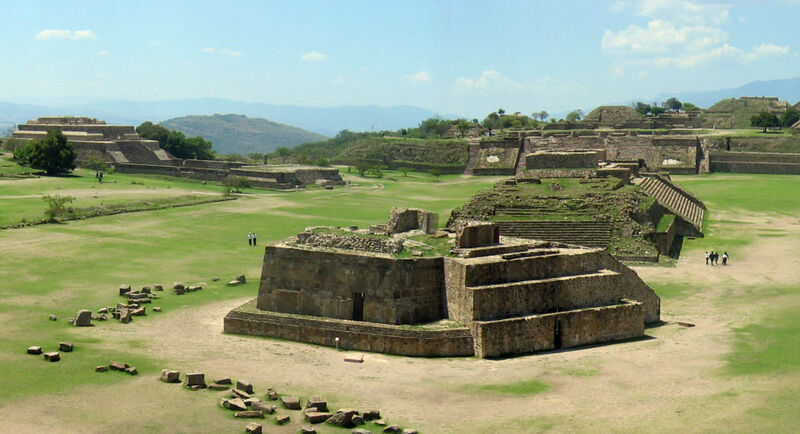 Monte Albán, which had its heyday from (very) roughly 500 BC to 500 AD, was the center of the Zapotec2 civilization. 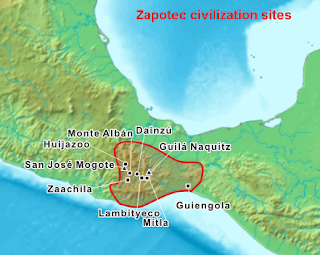 The city was constructed on a ridge about 1,300 feet above a series of valleys (containing lesser Zapotec cities) in what is now southern Mexico. It is visible from anywhere in the central Valley of Oaxaca and thus was never a "lost" city, like Machu Picchu. Today's postcard was never used. On the front are the notations B-142 and A.C.M. 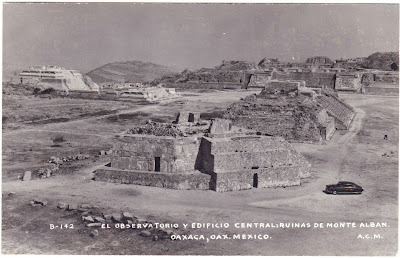 The caption on the front states: "El observatorio y edificio central: Ruinas de Monte Alban. Oaxaca, Oax. Mexico." So I don't have an exact date for when this photo was taken and when the postcard was published. My best guess would be the early 1950s. 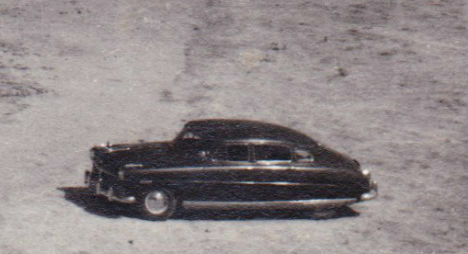 Perhaps the car pictured in the corner of the postcard can help us date it. Do any car enthusiasts out there know the make and model of this vehicle? Finally, here are then-and-now shots of Monte Albán from the same angle, using today's postcard and the a 2006 panorama photo from Wikipedia. 1. It's not clear where the name Monte Albán derives from, and the ancient Zapotec name of the city is not known. According to Wikipedia,"tentative suggestions regarding [Monte Albán's] origin range from a presumed corruption of a native Zapotec name such as “Danibaan” (Sacred Hill) to a colonial-era reference to a Spanish soldier by the name Montalbán or to the Alban Hills of Italy." 2. According to Wikipedia: "The name Zapotec is an exonym coming from Nahuatl tzapotēcah (singular tzapotēcatl), which means 'inhabitants of the place of sapote [a term for several soft, edible fruits].'"